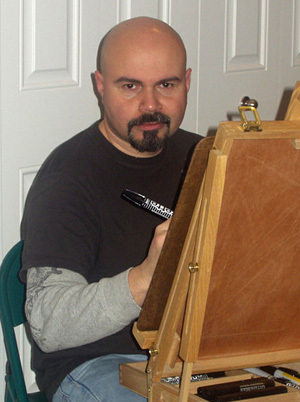 Ariel has been making his living as a freelance artist and caricaturist in Southeast Michigan since 1990. He attended the Center for Creative Studies in Detroit, where he majored in Graphic Communication and first	started to develop his caricaturing and cartooning style. Clocking in at about 3-5 minutes per face, he averages about 1,500 - 2,000 caricatures per year. Besides his long list of clients, which includes Chrysler, GM, McDonald's and Pepsi, he has also illustrated a children's book, "The Adventures of Lovable Huggy Brown".